The Amish, a Christian sect that immigrated to the U.S. in the 18th century to escape religious persecution in Germany and Switzerland, have long attracted the attention of the modern world. By opting for a simpler, more old-fashioned lifestyle, they are irresistibly fascinating to visitors. Those visiting Amish country are not just intrigued by their different lifestyle, but perhaps seek a reprieve from their own. Needless to say, Amish life is a sharp contrast to our high-tech, high-stress, high-consumption society. The Amish prefer to separate from the world and maintain self-sufficient communities that are free from modern conveniences like electricity, cars, etc. Amish leaders fear that such things would introduce worldly temptations into the society, causing people to stray from the simplicity and virtues that they value. A drive through Amish country will certainly evoke the feeling of being in a different, more placid era. Pennsylvania's Amish community is perhaps the most famous. Although its inhabitants are known as the Pennsylvania Dutch, they are not Dutch at all�they are Deutsch (German). The largest Amish population in the state is in Lancaster Country. Five million visitors frequent the area, which hosts the traditional Amish pastimes of roadside stands, farmer's markets, and antique and furniture shops. The commercial side of the county offers abundant lodging along with more mainstream festivals, museums, historic buildings, and steam-powered locomotives. For more information, visit the Pennsylvania Dutch Convention and Visitors Bureau website or call 800-PA-DUTCH. There are also several large Amish populations in western Pennsylvania. The Smicksburg/Dayton community, located about an hour-and-a-half north of Pittsburgh, has more than 800 Amish settlers. While in Smicksburg, take time to enjoy the Amish Wedding Feast at Stockdale's Restaurant, where a narrator tells a story as you experience the wedding event in the true Amish tradition. You'll enjoy an Amish meal, served family-style in a typical Amish setting, and you'll learn all about the traditional Amish wedding customs. For more information, visit the Smicksburg/Dayton website. Ohio boasts the largest Amish community in the world, estimated at between 35,000 to 45,000 people. The best place to get a look into their world is in and around the town of Berlin in Holmes County. Many farms and homes are open for tours, and you will have the opportunity to ride in a buggy and visit craft shops. As is the case with most Amish communities, you will find Amish specialties like cheese, furniture, and quilts for sale at establishments throughout the local area. For more information, visit the Holmes County Chamber of Commerce & Tourism Bureau website. There is a large Amish population in northern Indiana near the Michigan border. In the town of Nappanee, you can get an inside look at the daily lives of the Amish at Amish Acres, a historic farm which offers guided tours, buggy rides, and craft demonstrations. There are also a number of inns and restaurants that serve traditional home-cooked Amish cooking. Dinners are served family-style where heaping dishes of meat and potatoes will arrive at your table for you to help yourself. To find more information, visit the Amish Country of Northern Indiana website. 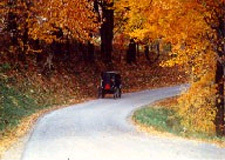 Driving in Amish communities is different than driving on other rural or urban roads. In Amish communities, you will see horse-drawn buggies or equipment on the roadway as the people travel to town or the fields. Here are some guidelines for driving in and visiting Amish country. Be respectful, polite, and courteous. Do not honk unnecessarily at the horses. Only use the horn to pass. Do not ask the Amish to pose for pictures as this is against their beliefs. Do not enter private property without permission. Do not pet or feed horses that are tied to a hitching rail. Other notes: Keep in mind that the Amish speak Pennsylvania Dutch to other Amish, but can speak and understand English. They call non-Amish people English or "Englishers." Furthermore, all Amish businesses are closed on Sunday because of the Sabbath. Understand that the Amish are a devout, quiet group of people who believe in a plain style of life. With their beards and plain dress, they may look strange to others, but poverty, crime, and disorder are virtually unknown to them. In that, we might all take a lesson from the Amish.